uhh... dont u think ur kinda obsessed with this thing? me? I'm not the one drawing them. and Hydro has done it over time and many months. besides the obsession is what spore is all about! well the gays in the Brokeback Movie were cowboys, and well this is a Naucean cowboy... get the idea? lol I get it thanks. I can picture it now nauceans on horses shooting eachother . Acully they ride lystropahnts, not horses. 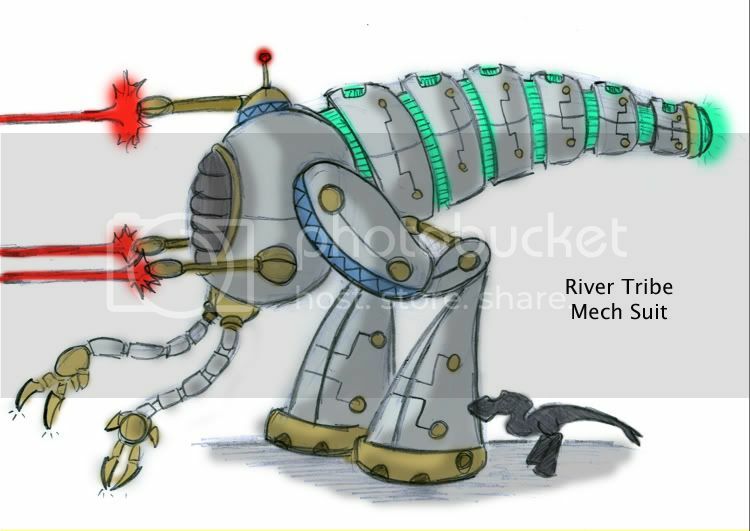 Here is a River Tribe War Mech Suit during the Robotic Age. These were used against the robotic uprising which almost eliminated the Naucean Species. Mechs are not new. They were first made during the Digital Age for construction and for missions on the moons, Serina and Sina. By the Biotech Age it was used in war against the Desert Tribe and to other maned missions to the neighboring planets Whrio and Oro. The Robotic Age War Mech is equipped with 3 rotating lazier cannons and a huge anti-matter cannon which comes out the "tail". This is very powerful and one of the main factors which one the war against the Robots. As for armor the whole structure is made amazing new alloys which were woven on the nano level. These are the precursor to the Nano Age where everything was quantum progamed rather than built. Also there are energy shields which fight against energy weapons such as lasers. The front arms are left overs from the construction days but have actually become quite useful in battle because it can move thing as well and throw things and cut up infantry androids with their microsharped talons. Man that is Soooooo cool.But we are always hearing about the river tribe,what about the others?Or is it like one big republic now?And what about the robots?What sickness weapons do they have ^_^? You have, yet again, outdone yourself, Hydro. Great work! 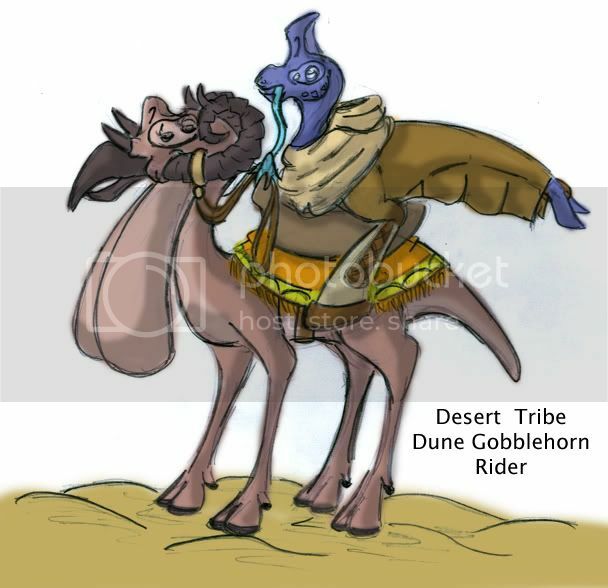 Here is a Desert Tribe Dune Gobblehorn Rider. Like the Mountain tribe the Desert tribe ride gobblehorns too. Except rather than a large woolly version they ride a thin and hairless desert variety. They tried lystrophants but found they are too much for the arid environment. The Dune Gobblehorn have curled horns like a ram and have HUGE waddles in which store fat in the same way an Earth's camel stores fat for the desert. They use these for their caravans in which stretch as far South as the Jungle Tribe, as far north as the Mountain tribe, as far West as the Grassland Tribe and as Far East as the River Tribe. Also will there be any changes to how the Nauceans look after each generation? Like will they have four legs instead of two after a certain amount of generations? Not quite the only differences by tribal stage are minor racial/breeds. The Desert tribe is the most extreme with a tall nostril crest, purple skin and more rough skin. If you look in like the early pages you can see the difference between the diffrent tribes. As for limbs, nope! No more changes major parts after tribal stage. Yeah I have had a look at the different head sizing and shapes of different tribal Nauceans, and I can tell that you have re-shaped them because of the habitat that they live in Im guessing. Any more pics to come today?